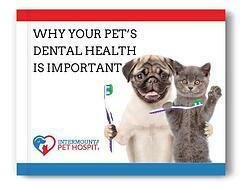 Your Pets Dental Health is More Important Than You May Realize! At Intermountain Pet Hospital, we know that good dental health doesn’t just give your pet's good breath and a better smile—it helps them stay healthier, overall. By bringing your pet in for regular dental exams and cleanings and taking care of their teeth at home, you can help your dogs and cats live longer and happier lives. You can prevent tooth pain and harmful infections and improve their overall quality of life. We all know humans who complain about every toothache on social media. However, for animals, dental pain and infections aren’t always easy to spot. Lots of dogs, for example, can keep eating and running around without showing how much pain they’re in. Regular dental care has benefits for the rest of your pet’s body, too. Good oral health helps minimize stress on the heart, liver and other organs. Here is some important information about dental disease in pets and what you can do to prevent it. WHAT CAUSES GUM (PERIODONTAL) DISEASE IN DOGS AND CATS? Gum disease in animals has the same cause as gum disease in people. It’s an infection caused by soft dental plaque building up on the teeth around the gums. This plaque contains bacteria, which can irritate the gum tissue if the plaque keeps building up. Eventually, the bone around your pet’s teeth can become infected. Another cause for concern is hard dental tartar (or calculus), which forms when calcium salts from your pet’s saliva sticks to the plaque. Tartar starts to form after a few days on the surface of a tooth that isn’t kept clean. It creates a rough surface that makes it easy for even more plaque to build up. Once it starts getting thick, tartar is very hard to remove without dental instruments. WHAT EFFECTS DOES GUM DISEASE HAVE ON MY PET? The symptom that most pet owners notice first is bad breath. Unfortunately, gum disease creates far bigger problems for the pet's health than for the owner's nose. Your pet’s gums become irritated and sore. The gums may also start bleeding. Your cat or dog could lose their appetite or not be able to adequately chew food or keep food in their mouths while eating. Gum disease can harm the roots of your pet’s teeth. Not only could their teeth become loose and fall out, but bacteria around the roots could enter their bloodstream, leading to kidney, heart and liver damage. Now that you know about gum disease and its consequences, here are some steps you can take to keep your pet's teeth healthy. Take your dogs and cats to a veterinarian once a year for a professional dental exam. If deemed necessary a professional dental procedure may be recommended. Dental Home Care to prevent problems in the future. It’s important to note that radiographs on EVERY pet and EVERY tooth are essential for great dental health because 41% of dental disease occurs under the gum line. Without dental radiographs, veterinarians can’t spot where the problems are. With an 82% effectiveness rate for preventing dental disease, brushing your pets’ teeth DAILY is your best home dental care option. You need to do it every day because it takes 24 hours for plaque to become calcified into tartar. Use a flavored toothpaste (CET toothpaste or Petsmiles--VOHC-approved) to create a positive experience for your pet. To enhance the benefits of brushing, even more, you may apply Maxigard Gel to your pet’s teeth with your finger five minutes before brushing to loosen any plaque or tartar that has built up. Greenies: Applies mechanical cleaning (VOHC-approved). Treated Rawhide strips (CET): Applies mechanical cleaning and a bacterial inhibitor. Organic “natural” chews: Includes raw bones, Bully sticks, pig ears and hooves. Generally speaking, the more you spend on a chew, the safer it is (less chance of broken teeth, obstructions, etc.). Research shows that water additives are 55% effective in preventing dental disease in pets by preventing the growth of harmful bacteria. Mix it into their water every day. Two additives that IPH endorses are Oratene and Healthy Mouth (both VOHC-approved). Both are available on our website online store. According to research, special dental diets in themselves are 39% effective in preventing dental disease. We recommend Science Diet T/D (VOHC-approved). Its large woven kibbles mechanically clean teeth while your pet chews. This needs to be the sole diet to be effective. Using it occasionally as a treat does little good. 1) How involved do you get in procedures? Veterinarians are 100% responsible for the pets under their care. They need to prescribe the anesthetic that each pet receives, which will vary depending on the animal’s age, breed and health conditions. A vet also needs to oversee all aspects of the procedure. 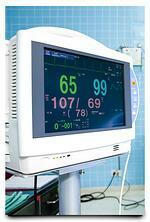 2) Do you have a nurse on staff to monitor anesthesia during dental cleanings? Many veterinary hospitals will have the same person perform dental cleanings and monitor anesthesia. They do this to save money, and unfortunately, it can cost you the life of your pet. You simply can’t do two jobs, to the best of your abilities, at once. This is especially true when it comes to administering anesthesia—when pets die while under anesthesia, it’s usually because someone needs to multitask. Your veterinarian should have a nurse on staff to watch over the anesthesia and address any problems that arise (make sure they have top-notch equipment too). 3) Do you have certified and/or well-trained technicians who can perform cleanings? Human dental hygienists need specialized training to perform cleanings properly. The same goes for pet dental hygienists. 4) Do you take full-mouth radiographs on every pet, every time? As we mentioned earlier, radiographs are a crucial part of good dental care. Without them, many cases of dental disease will go unnoticed, leading to pain and infected teeth in your pets. You shouldn’t need to pay for a procedure—not to mention one that potentially puts your pet at risk—and have it prove ineffective. Your veterinarian should take full-mouth radiographs (not just certain teeth) on every pet. The more radiographs that a vet takes, the better chance they’ll have to diagnose diseases correctly. 5) Do you give instructions for home dental care? 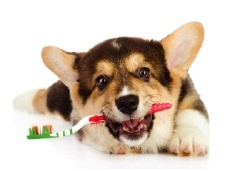 Each pet owner should get detailed, customized and written instructions for giving their animals dental care at home. 6) Do you have or give recommendations for VOHC-approved dental products? Your vet should be able to provide or recommend products that meet the objective, measurable standards for reducing plaque and tartar in dogs and cats. Dental care products with the VOHC seal of approval have undergone rigorous testing and been found safe and effective. By taking care of your pets’ teeth, you can go a long way towards giving them better lives. Have trained, knowledgeable professionals give them dental exams and do what you can to maintain their teeth on your own. Taking these steps ensures that you and your pets have many years of companionship. If you want a copy of the ebook emailed to you, fill out the form on this page and we will send it right over. Do you want us to email you the ebook?